Per serving this recipes packs 164 calories, 23g carbs, 6g fat and 5g protein. 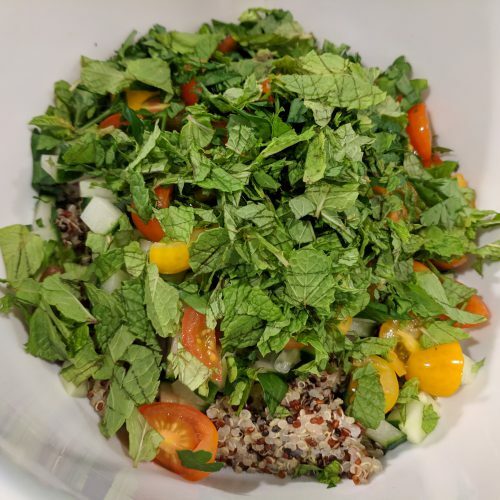 It is loaded with some delicious veggies and most importantly mint! It is refreshing and filling at the same time! OK, so let me preface this paragraph with, I eat quinoa all of the time. In moderation. 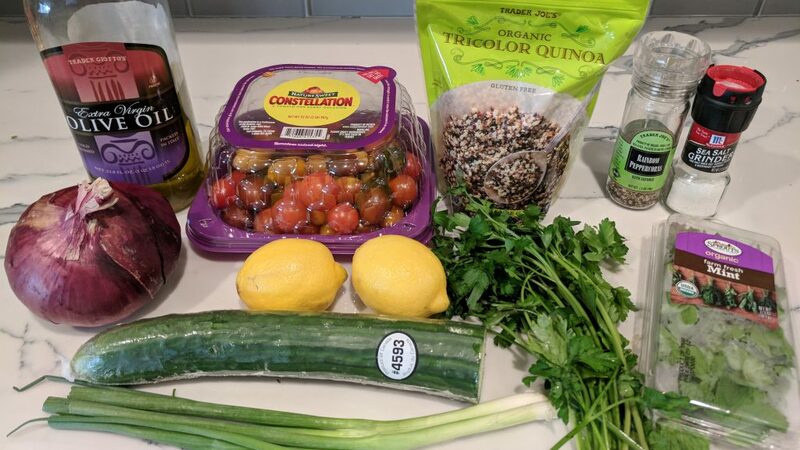 Quinoa has protein but don’t be fooled that it is jam packed with it. 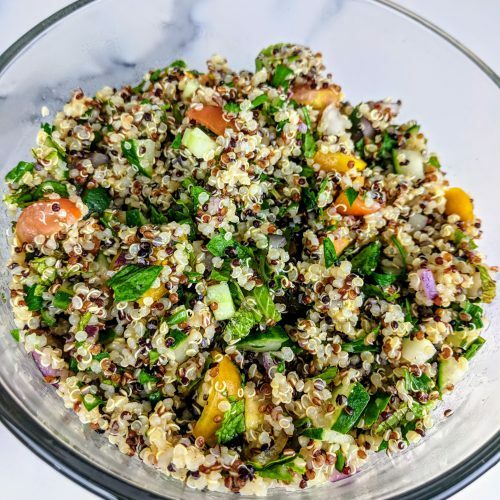 To get the amount of protein you should eat in a day from Quinoa you would have to eat a BOATLOAD of it. Which would be fine except that your carb counts would be off the charts. So while it is a source of protein, it is also a carb bomb (if you let it be). Eat in moderation and you will be just fine. 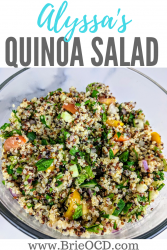 This quinoa salad is the perfect dish to bring to a party because it is served cold, it is gluten-free and vegetarian, making it party friendly for just about any guest (unless they hate veggies lol). HOT TIP – Make sure you cook this in advance, to let it cool in the fridge for at least 15 minutes before serving. It will taste much better when it is cool! I hope you enjoy this as much as we all did! combine all ingredients in a medium bowl. Stir. 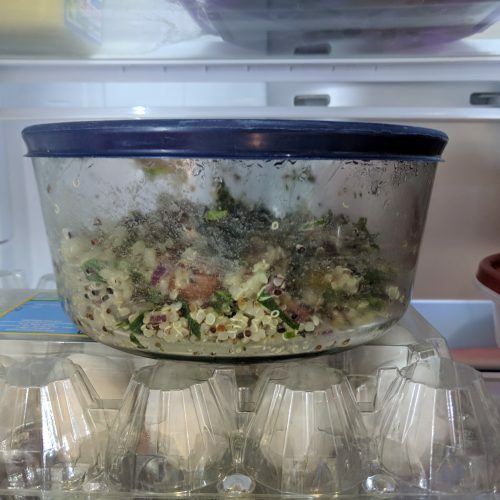 cover and refrigerate for at least 15 minutes. 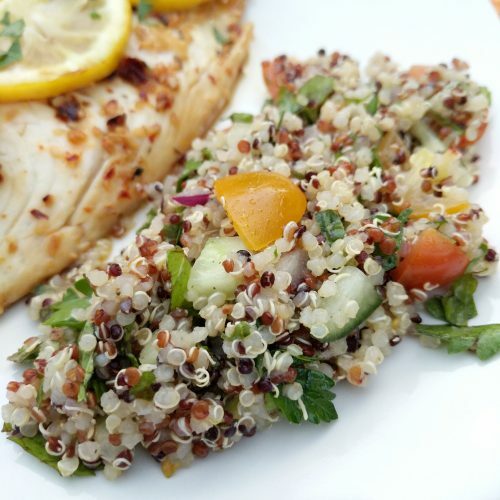 serve cold with your protein of choice (lemon Garlic tilapia pictured) and enjoy!